Bone Mineral Density testing is a vital measure in the early detection of osteoporosis. 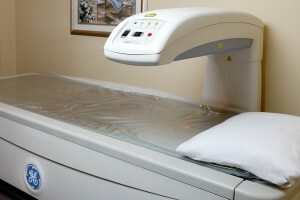 The test uses two different X-ray beams to estimate bone density in the spine and hip. The examination is quick and painless. It provides physicians with the most accurate measure of bone loss and mineral composition available. You must be referred by your physician for this test. Bone Mineral Density testing is by appointment only. Locations and operating hours can be found here.